P aul’s first solo single to top the charts, “Uncle Albert/Admiral Halsey” is one of several expert patch-jobs that fused disconnected melodies into miniature pop masterpieces. (Paul would repeat the feat over the years with “Band on the Run” and “Venus & Mars/Rock Show.”) The flip side is another winner, “Too Many People,” which rocks harder than anything else on Ram (and would have actually been my choice for the second single). Ounce for ounce, this is one of McCartney’s more magical singles. Incidentally, I have no idea what the A side is about; just one of those midday reveries I suppose. Note that, according to Tim Neely and his absolutely indispensable "Goldmine Price Guide to 45 RPM Records (3rd ed. 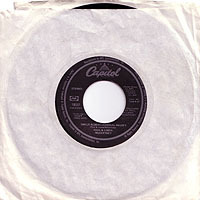 )," two additional variations of the original Apple release exist: with "Paul" misspelled on the producer credits and with an unsliced apple on the B side. The author/historian goes on to catalog a 1975 reissue, distinguished by the inclusion of the words "All rights reserved" on the label. Musical numberers would do well to invest in one or more of Tim's price guides, available at www.krausebooks.com.